Last Sunday, I wrote a review of the opening concert of the TSO’s 2016 New Creations Festival (NCF), published in both Musical Toronto and the Toronto Star. In the review, I mentioned that I found it distressing that the festival did not include any female composers. Not a one. It was a fair criticism I thought, considering that despite the hundreds of talented women composers working today, one of the most important contemporary music festivals in Canada has gone ahead with a 100 percent male-only festival. It seems that the TSO were listening when I received an email from them expressing that they felt “disconcerted” about my statement and that it was unfair. They said I implied that the TSO did not attempt to include women in the 2016 festival and said that they invited (at least) two women — a composer and a choreographer — to participate. These women were unavailable, and so instead of simply asking others, they left them out altogether. It was a somewhat defensive response that places the blame on the women who were invited but were not able to attend. Of course, there are plenty of men (alive and well) featured on the programme who could not attend, but that did not stop them from having their works played; a clear double standard. The TSO continued by stating that the NCF ancillary events are curated by composer Abigail Richardson-Schulte (as in last year’s festival, which starred Barbara Hannigan and included music by Vivian Fung). This may be true but still does not speak to the fact that there were no women on this year’s mainstage events. The TSO have always struck me as an organisation that strives for transparency and fairness. They have a strong representation of women in the orchestra and regularly programme female performers throughout the season. I’m thankful that despite going on the defensive, the TSO remain open to dialogue. 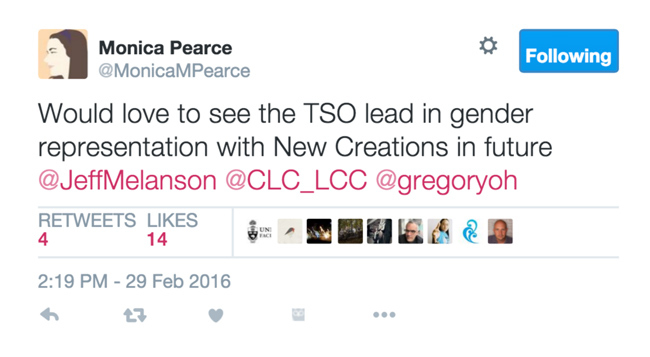 Monica Pearse‘s, a leading female composer and arts administrator in Toronto, tweet nails it. 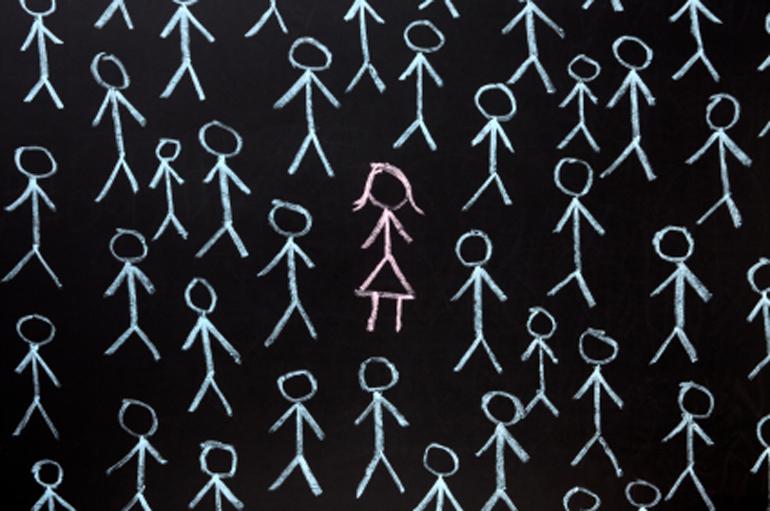 The fact is that female composers consist of nearly 50 percent of composition students across our universities and are a fundamental part of our overall composition community. According to statistics, the University of British Columbia’s School of Music is composed of 67 percent female first-year students. 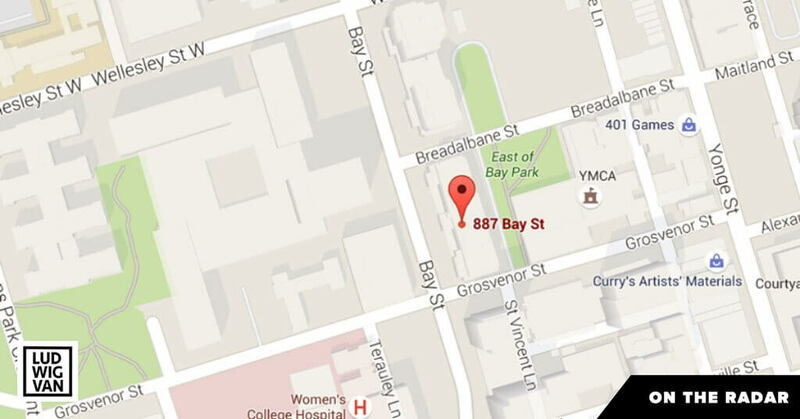 McGill comprises 48 percent first-year female students. I suspect most Canadian universities fall within those numbers. Female conductors, on the other hand, remain few, but there are telling signs of growth. A recent example includes the appointment of 29-year-old Gemma New as the Music Director for the Hamilton Philharmonic Orchestra. There is also Victoria Symphony Orchestra’s long-time conductor, Tania Miller, and hometown favourite Barbara Hannigan, who has taken up the baton with the Ludwig ensemble and the TSO on many occasions. In the composition community, there is a good representation of women, but major orchestras are still disproportionately focused on male composers. A recent US survey of 22 American orchestras showed female composers accounted for only 1.8 percent of the total pieces performed in the 2014-2015 concert season. 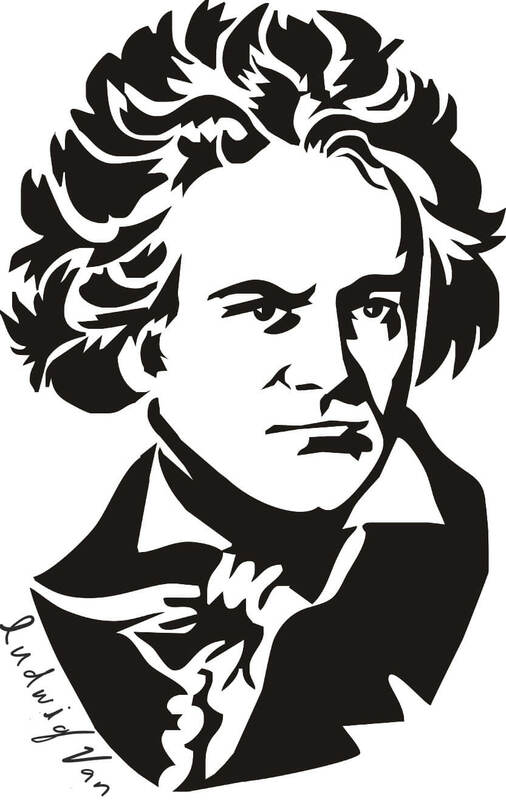 Although this is likely due to the fact that orchestras perform pieces composed through the ages, whereas women have outwardly composed music for just about half a century. But in the context of a New Music festival, the percentage by default should be higher. 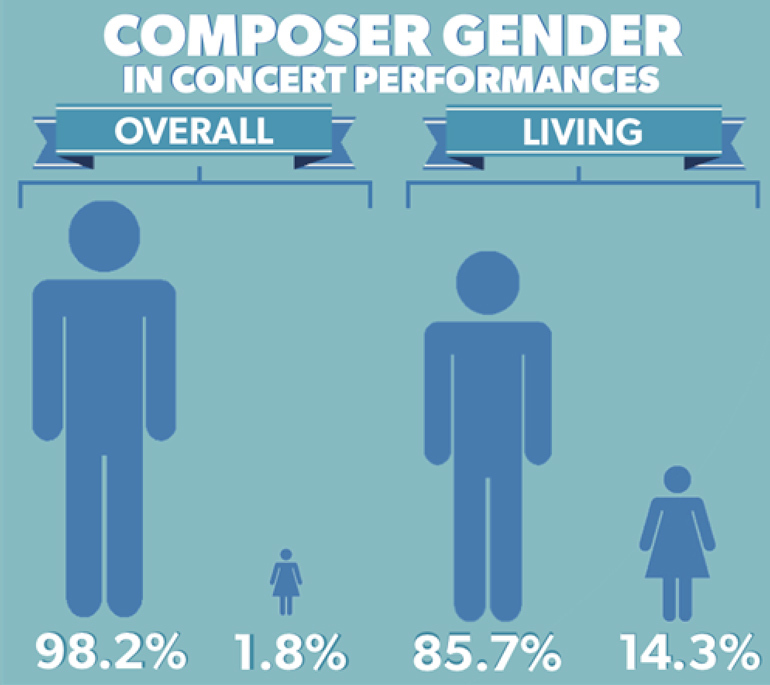 Inconvenient statistics aside, gender balance issues remain a touchy subject for Canadian orchestras. The TSO’s reply is a case in point. 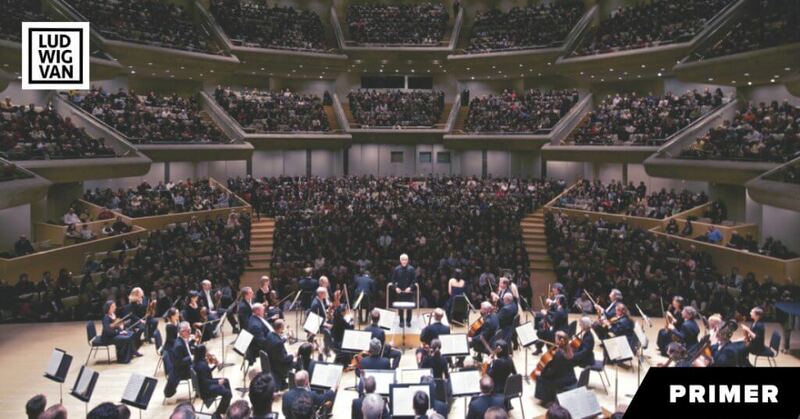 Some readers might recall last year’s dust up between former CBC reporter Michael Morreale (now employed by the TSO) and Vancouver Symphony Orchestra conductor Bramwell Tovey, after Morreale penned a scathing portrayal of gender imbalance in the orchestra. I followed-up on the story with an editorial, where Morreale stood by his reporting. We saw something similar more recently with the Winnipeg New Music Festival this year. I was approached by composers who felt that they were being ignored by the festival. They claimed that Canadian content was far too low and that there weren’t enough female composers involved. Following some fact-checking, I found that female representation was indeed low, but still present. That didn’t stop Holly Harris at the Winnipeg Free Press from covering the story (“Overwhelmingly male slate mars New Music Festival“). In her piece, she pointed fingers at the festival programmer Matthew Patton for essentially using the festival as his private “old boys club”. At the end of the day, the buck always stops at the programme directors. The job is not an easy one. They seek to produce the best possible events while balancing shows against projected ticket sales, marketing and production costs. 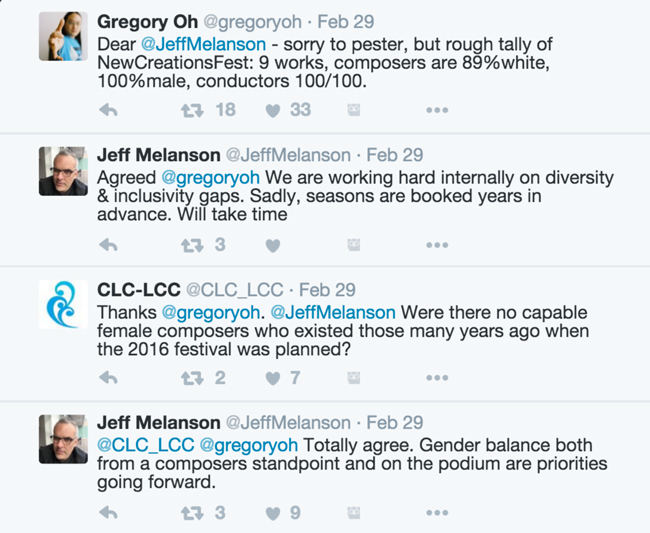 Gender issues don’t seem to be a high priority against the financial pragmatics of running an orchestra, let alone a new music festival. Some go so far as to suggest that women would be programmed more if they could just write better music. I’d encourage anyone to seek out the music by composers like Analia Llugdar, Ana Sokolovic, Alexina Louie, Melissa Hui, Nicole Lizée, Anna Hostman, Linda Bouchard, Anna Pidgorna, Zosha Di Castri, Hope Lee, Linda Catlin Smith, Jocelyn Morlock, Juliet Palmer (and many others) and not find it to be any less compelling of that of their male counterparts. It is this kind of dire situation that was the cause for the creation of The Association of Canadian Women Composers.Formed in 1981, they sought to fill the void in the Canadian music scene that they define as “the absence of women composers in concert programming across the country.” Looking at the all-male 2016 New Creations Festival, their plight is alive and well. Membership stands at around 60 members. Getting back to the TSO and this year’s festival, I don’t think any of this was done out of malice or as a grand statement on social commentary. It was more likely a matter of indifference. The good news is that things are turning around for 2017: next year’s 2017 New Creations Festival will feature works by Nicole Lizée, Cassandra Miller, Tanya Tagaq & Christine Duncan. So in honour of International Women’s Day, let’s open a dialogue about these difficult issues. And instead of getting defensive, address it. Opera Place: Toronto's would-be opera house that the Government turned into a condo development.